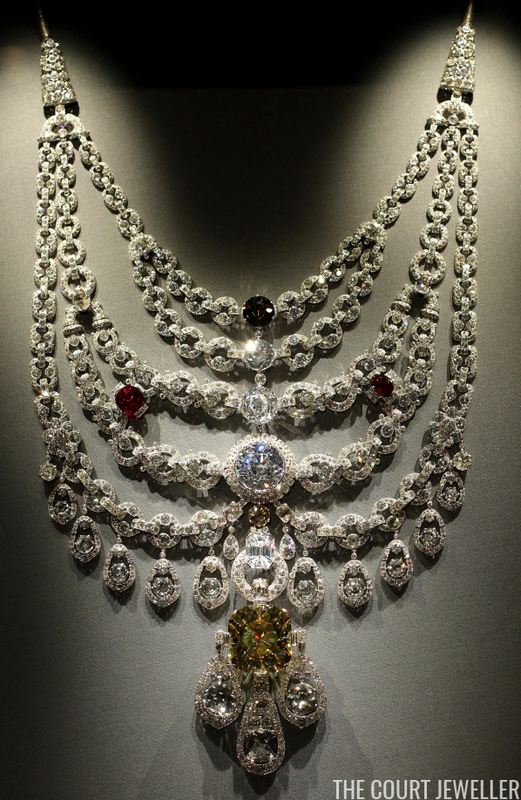 The necklace is the single largest commission ever made by Cartier. In 1928, Sir Bhupinder Singh, the Maharaja of Patialia, arrived at the firm's Paris headquarters with literal buckets full of loose gems and asked them to make him a necklace. Among the bounty of loose gemstones was one very important diamond: the 234.69-carat De Beers Diamond, which the maharaja had inherited from his father, Maharaja Sir Rajinder Singh. Rajinder had purchased the pale yellow, golf ball-sized diamond, which was at the time the seventh-largest polished diamond in the world, after seeing it exhibited in Paris in the 1880s. In 2002, Wendy Moonan of the New York Times described the creation process: "The necklace is basically Art Deco in style; Cartier was at the vanguard of designing jewelry, clocks and objets d'art in the Deco style. When the necklace was completed in 1928, Cartier was so proud of the craftsmanship that it asked if the necklace could be exhibited before being sent to India. The maharajah agreed." The gemstone count on the finished necklace was, well, insane. The platinum necklace was set with 2,390 diamonds, including the De Beers and a large diamond described as "tobacco-colored." Two Burmese rubies were also set in the piece. The necklace became one of the flamboyant prince's most treasured pieces of jewelry, and he wore it regularly until his death in 1938. The necklace was last worn in public by his son, Maharaja Yadavindra Singh, in 1941. And then the necklace went missing from the Patiala treasury, although some believe that it may have been quietly sold for tax reasons. In 1982, the De Beers Diamond popped up at auction at Sotheby's Geneva. And then, in 1998, a Cartier associate, Eric Nussbaum, found the platinum chains of the necklace in a second-hand jewelry store in London. Nussbaum convinced Cartier that they should purchase the remaining parts of the necklace and restore it, replacing the enormous missing gemstones with synthetic stones and cubic zirconium. It took Cartier's jewelers two years to restore the magnificent piece. Now, Cartier regularly exhibits the necklace, so that all of us can experience a little bit of the incredible wealth and lifestyle of Patiala's most extravagant ruler.